Lakes of Delray is a 55+ condominium community in Delray Beach, Florida. This gated active adult neighborhood provides homebuyers with a magnificent clubhouse that offers plenty of amenities and social activities to keep them busy throughout the year. Residents also enjoy having access to a car wash area and community bus transit. Homeowners will enjoy lush landscaping, low-maintenance condos, and scenic lakes and ponds in a convenient location within Palm Beach County. 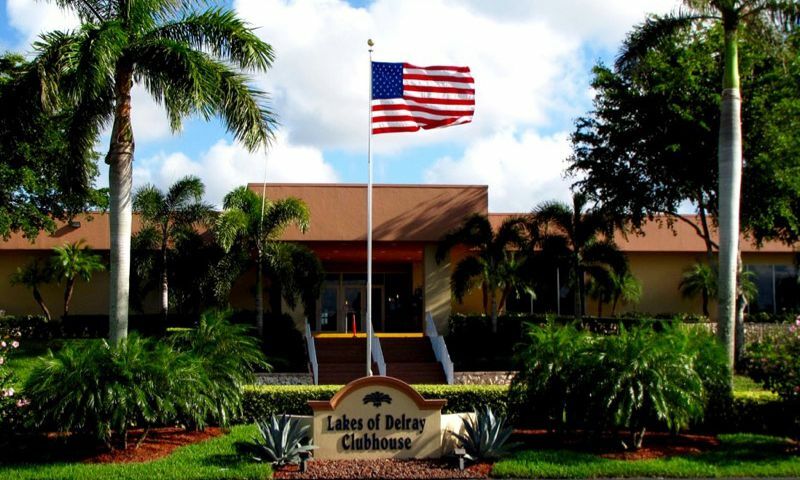 Residents within Lakes of Delray enjoy the amenity-filled clubhouse. The clubhouse features an exercise room, saunas, and locker rooms. Residents can socialize in one of the many spaces provided such as card rooms, meeting rooms, billiards room, conference room, and catering kitchen. They can explore their creative side in the arts and crafts or ceramics studio. Homeowners can relax with a good book in the peaceful library. They can attend community events or watch shows in the ballroom that comes equipped with a stage and the latest sound and lighting systems. The rich line up of amenities continues outdoors. There is a pool and spa, perfect for enjoying the Florida weather. Neighbors can mingle in the patio or BBQ area during holiday weekends. Residents can challenge friends at one of the many sports courts available including tennis, bocce ball, shuffleboard, racquetball, and basketball. A golf driving range and horseshoe pits are also available for homeowners to use. Residents enjoy the community bus transit that will take them around town for shopping and other errands. There is a car wash and vacuum area where residents can clean their car without having to travel outside of the community gates. Homeowners are never too far from the amenities in Lakes of Delray. There are satellite amenities found throughout the community that include two outdoor pools, six shuffleboard courts, and two tennis courts. Lakes of Delray was developed by Lennar Homes between 1982 and 1994. The community consists of about 1,400 condo units. Lakes of Delray has a variety of two and three-story condo buildings. Condo units are available on a resale-only basis. They offer about 800 to 1,500 square feet of living space. Condo units usually have one or two bedrooms, one to two bathrooms, and a parking lot space. Some condos may have updated features like granite countertops, modern appliances, ceramic tile or marble flooring, screened patios or balconies, and walk-in closets. Residents have plenty of clubs, classes, and activities to keep their social calendar filled all year long. Lakes of Delray provides an active environment for homeowners to enjoy with friends and neighbors. They can join AARP, art club, book discussion group, fishing club, bird watching, current events discussion, men's club, and women's club. Homeowners can stay fit by participating in water aerobics, Zumba, tennis, or bicycling. With about 30 clubs and a long list of activities and events to choose from, residents can find something to do in Lakes of Delray that meets their interests. Located in beautiful Delray Beach, Florida, residents are close to the Florida Turnpike and Interstate 95 that make driving around the city a breeze. Delray Beach provides great beaches along the Atlantic Coast. Homeowners have easy access to plenty of shopping choices such as Walmart Supercenter, Big Lots, The Home Depot, and Marketplace at Delray. Golfers will love being located close to Sherwood Park Golf Course, Addison Reserve Country Club, and Delray Beach Golf Club. Cultural attractions like the Morikami Museum and Japanese Garden are just 13 minutes away. When traveling farther is necessary, Palm Beach International Airport is 30 minutes away and Fort Lauderdale International Airport is 50 minutes away. Lakes of Delray is an established 55+ community with a wide selection of amenities and activities in a convenient location within Palm Beach County, Florida. Residents can enjoy all of the amenities at the clubhouse. Residents are never far from great amenities in the neighborhood. There are plenty of activities available in Lakes of Delray. Here is a sample of some of the clubs, activities and classes offered here. Lakes of Delray has a variety of two and three-story condo buildings. Condo units are available on a resale-only basis. They offer about 800 to 1,500 square feet of living space. Condo units usually have one or two bedrooms, one to two bathrooms, and a parking lot space. Some condos may have updated features like granite countertops, modern appliances, ceramic tile or marble flooring, screened patios or balconies, and walk-in closets. Please Note: Floor plans are not available at this time. I've been an owner at Lakes of Delray for almost 3 years and love it! It is clean, well maintained and offers a variety of activities & groups. I play on the billiard team & my wife & I are part of the photography club. Our neighbors are the best & we enjoy dinners together & pool days & barbecuing. There's movies on Friday nights and the beach 10 minutes away. Our board President takes meticulous care of our building, like it's his own. I am thoroughly satisfied with Lakes of Delray and highly recommend it! My spouse and I are snow birds and we LOVE Lakes of Delray. The problems that Nancy described are not universal. We have a Board President at Pembridge D that keeps our section of condos meticulous and bug free. (Each section has their own HOA Board). The grounds are well kept, the halls are cleaned each week and we are proud to call LOD/Pembridge D our home. We have a lovely lake behind our home which is so tranquil and picturesque. There are walking paths and satellite pools, clubhouse and big main pool and hot tub. We feel so fortunate to have found LOD and enjoy it 5 months a year. Our Board President arranges welcome breakfasts and luncheons to foster a community camaraderie and I love my neighbors. We go out to dinner and to the pool and beach. LOD is a wonderful community. We have renovated our condo so it is like having a brand new condo in an established community. The HOA fees and taxes are very reasonable for all the amenities. I can't say enough great things about Lakes of Delray! 55places.com is not affiliated with the developer(s) or homeowners association of Lakes of Delray. The information you submit is distributed to a 55places.com Partner Agent, who is a licensed real estate agent. The information regarding Lakes of Delray has not been verified or approved by the developer or homeowners association. Please verify all information prior to purchasing. 55places.com is not responsible for any errors regarding the information displayed on this website. 15055 Lakes of Delray Blvd.